Tooth decay (also known as caries within our profession) is a condition that affects over 90% of adults in some degree. It is the most prevalent dental condition in the United States and likewise fillings on decayed teeth are the most commonly performed procedures in most dental offices. Acid + Healthy Teeth + Time = Tooth Decay. When the decay is shallow, it sits in the top layer of the teeth, called the enamel. Once it progresses beyond the enamel, it reaches the inner layer, called the dentin. Once decay progresses into the dentin (or very deep into the enamel), it becomes problematic and must be treated. Some decay can be spotted visually or identified using a tool called an explorer. However, most decay (and the depth of ALL decay) must be identified and confirmed using dental x-rays. Since x-rays work by showing relative densities, decay will appear as a dark (less dense) spot against light (more dense) teeth. 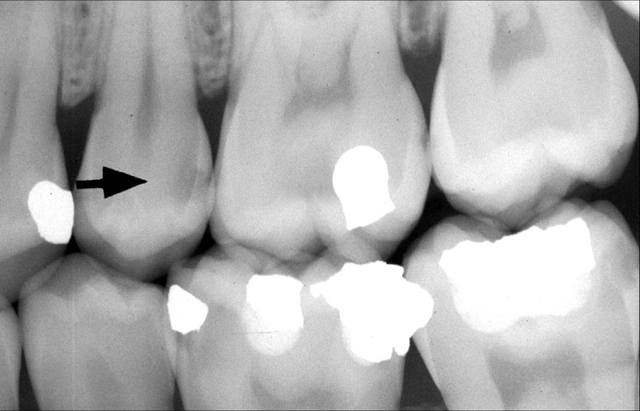 The top left arrow is pointing to the "shadow" left by decay on an otherwise healthy tooth. Once decay is identified, it can typically be treated by performing a standard dental filling. In our office, a variety of technologies and techniques make this as quick and pain free as possible. We start by getting you numb using a syringeless anesthetic delivery system known as The Wand. From there, a combination bite block and suction called an Isolite is used to keep the area clean, dry and protected while we work in your mouth. Decay is removed quickly and completely, using a combination of electric handpieces (commonly known as “drills” although they do not perform a drilling motion), and diamond tipped burs (analogous to a “drillbit”). Once the tooth is “prepared” (cleared of all decay and shaped properly), we begin the actual filing process. At Thousand Oaks Family Dentistry, we utilize the most advanced composite materials for longevity, esthetics and speed of use. The composites we use match or surpass the durability of silver fillings, and thus we only place tooth colored (nonmetal) fillings. In fact, we use four different composite filling systems matched to one of three bonding systems in an entire spectrum of tooth colored shades to address a variety of concerns. We firmly believe that there is no one-size-fits-all approach to dentistry, and will curtail our process to each individual person. After the teeth are filled, we will give the tooth an anatomically correct shape using a “finishing bur.” After that, we adjust the filling using contact (biting) paper, polishing disks and polishing burs to make sure it looks and feels outstanding. Our ultimate goal with any filling is that you cannot tell where the filling stops and your natural tooth begins!